Surigao City is the center of commerce and trade, education and politics in Surigao del Norte and to its nearby provinces such as Surigao del sur and Agusan del Norte. Located at the north easternmost tip of Mindanao Island, Surigao City is considered to be one of the most competitive small-sized Cities in the Philippines according to the Asian Institute of Management in the year 2012. 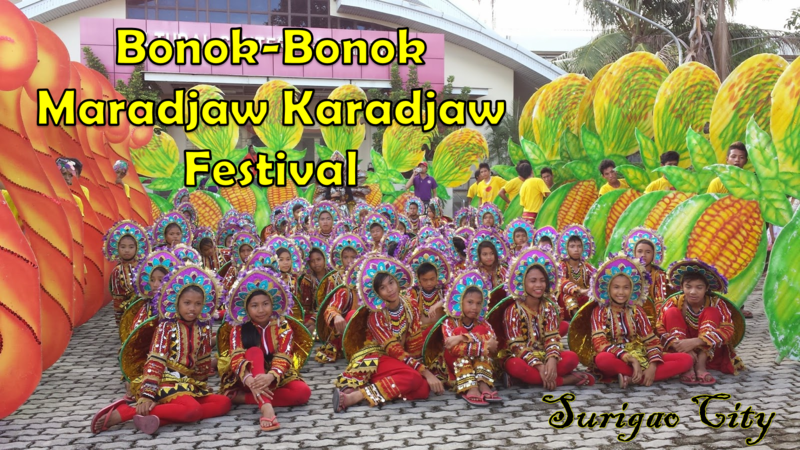 Bonok-Bonok is a festivity held during September 9 of every year in Surigao City. It is a celebration in honor of the City’s Patron Saint, Senor San Nicolas de Tolentino. The celebration is a thanks giving of a yearlong bountiful harvest and peaceful living of the people. It is also a merriment occasion praying for the intercession of the grace of the Almighty Father through San Nicolas de Tolentino. The natives of Surigao the Mamanwa Tribe people are the origins of Bonok-Bonok. Bonok-Bonok is a tribal dance performed mostly during thanksgiving, merriment celebrations such as weddings, harvest and worship ceremonies. The dance will be officiated by a “Baylan” or an indigenous priest of the tribe. The Mamanwa people showcase their rich culture through their colorful artistic jewelries, patterns and crafts. These are worn during the street dancing competition held on the festival day. The celebration is composed of other activities that are officiated before the day of the festival. What makes this celebration different from other festivals around the country is the showcasing of the importance of the old customs of the tribes that originates the people of Surigao. The intricate culture that evolves and passed through generation to generation is greatly celebrated even today with a little touch of modernization. The indigenous settler’s takes a big part in the festivities that highlights their culture to the modern society of today. According to history the festival was formed after a devastating typhoon hit Surigao the Typhoon Nitang in September 2, 1984 that destroyed 70% of Surigao City. This is to remind every Surigaonons and the other people of the world that even after a disastrous typhoon, the tragic loss of lives and properties, still, Surigaonons are to move forward and continue to celebrate life.